Reformation Day lecture given at Covenant of Grace PRC (Spokane, WA) by her pastor, Rev. R. Kleyn. The speech commemorates the 400th anniversary of the Canons of Dordt, 1618-19. Reformation Day lecture given in Covenant of Grace PRC (Spokane, WA) by guest minister, Rev. Brian Huizinga (Hope PRC, Redlands, CA). 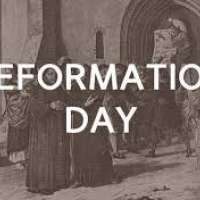 Reformation Day lecture delivered by Rev. Nathan Langerak, pastor of Crete PRC, IL.